Bike lights today let you expand your riding hours without interfering with the ride. Front bike lights can be split into two categories, to see with and to be seen lights. The first category is like a car headlight or flashlight that throws a beam of light to help the rider see while in motion. The next category is like a reflector or tail light meant to enhance the rider’s visibility to avoid getting hit by a vehicle or other traffic. This article will cover lights to see with in the sweet spot range of $100-$300. There are other very expensive lights and much cheaper ones but we’ll tackle those in subsequent stories to help you find the best bike lights for you. Niterider Lumina 1200 features a very well built housing unit with good ventilation. The Lumina line is one of the most established lights in the business starting with 400 lumens many years ago. They’ve provided a robust, heat dissipating chassis that has stood the test of time. The mount is first-rate and cinches down on the bar securely while allowing adjustability for proper aiming. The light itself is bright and it is stable, as it dissipates heat properly to provide a consistent beam throughout its runtime. Sealing is excellent, as this will take you through a season of wet weather without any issues. The heat sink materials are nicely integrated with a shock absorbing rubberized material, so this light can take a few hard knocks. 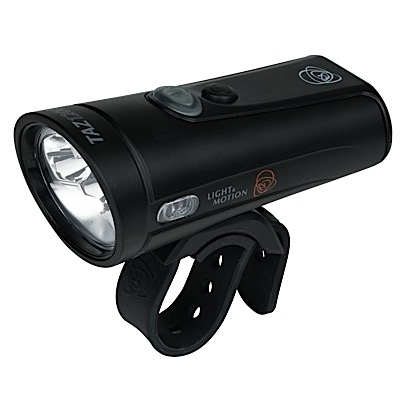 Now, it pumps out an impressive 1200 lumens and it’s still as reliable and compact as ever. And there’s something to be said about a company that has employed dozens of people in San Diego, CA for the last 25 years. They’ve stayed true to form designing and building lights right here in the U.S. under the leadership of their founder Tom Carroll. 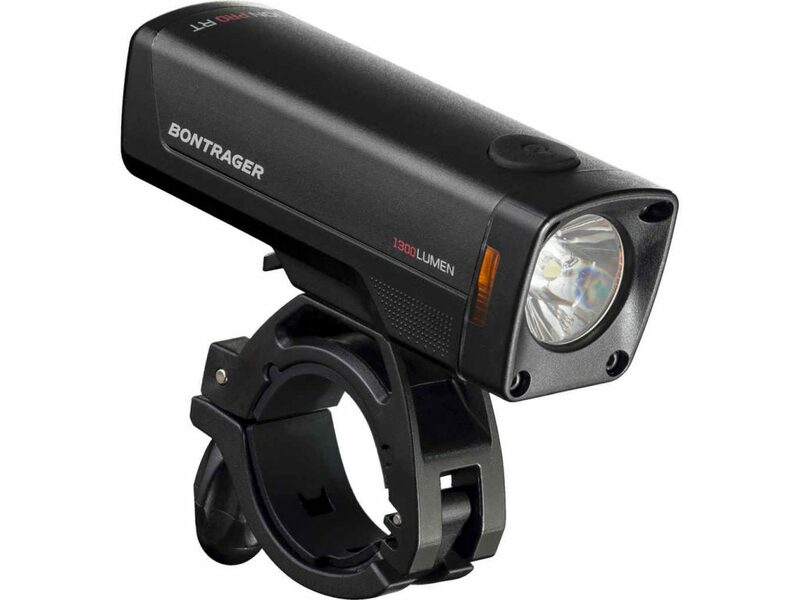 Bontrager has a fascinating line of Ion lights. This latest one called the Ion Pro RT sporting 1300 lumens in a compact package. It’s packed in a robust, reliable package with a nice switch and versatile bike mount. 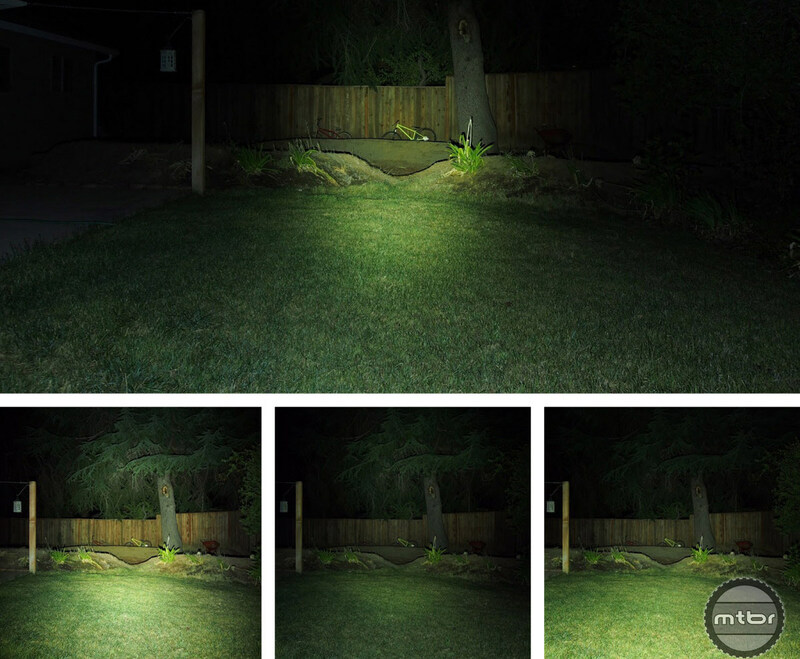 Beam pattern is bright and even and the output is an honest 1300 lumens. There is side lighting available which is handy for side visibility for the commute home. Wireless technology allows the use of a remote Bluetooth switch as well. 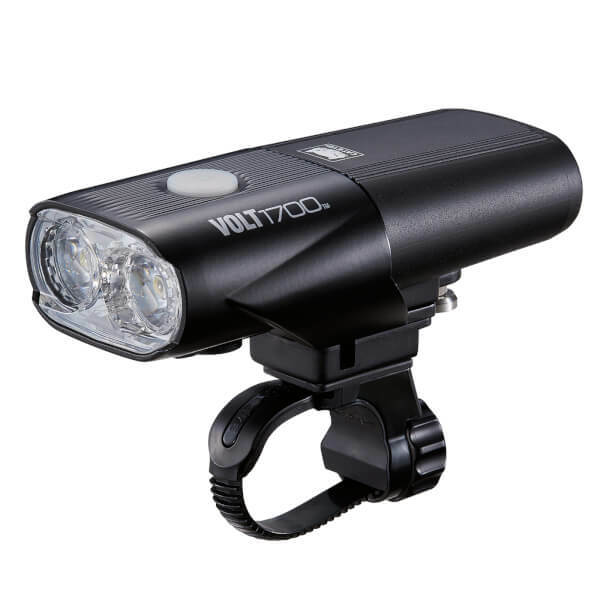 1700 lumens is a very good achievement as they keep making this dual lens chassis more powerful. Battery life on high is 2 hours with a powerful 3100 mAh battery. Charging time is 5 hours with a 1 watt USB or longer with a standard phone charger, as the light can detect and take advantage of more powerful USB currents. The beam is shaped as well, with squared-off edges to track the trail better and use the light more efficiently. It sports quality construction that CatEye has been long known for. The mount is the old bike computer ‘radiator clamp’ type mount and it works perfectly for this application. It accommodates all handlebar sizes and the light can be cinched down very securely. The Light and Motion Taz is self-contained but has a no-compromise beam pattern. The Light & Motion Taz 1200 is all about beam pattern. We’ll even go out on a limb and say it has the best beam pattern of any self-contained bike light. The only thing that held it back was it wasn’t quite bright enough when it was initially introduced at under 1000 Lumens. The beam pattern is so big that it needed a lot of light to execute good throw and even spread. With the Taz 1200, now it is bright enough. It’s ideal for riding fast or even using by itself. For the ultimate speed setup, complement it with a bright helmet light and you’re off to the races. But if it’s uncompromising self-contained performance that you want, the Taz 1200 delivers with a bright, even and wide beam pattern that even has a pleasant yellow color tint that allows you to see shadows and trail contours clearly. The industry standard for measuring brightness is Lumens similar to horsepower ratings for an engine. It is the true measure of visible light and for reference, a 100-watt incandescent light bulb emits around 1600 lumens while car headlights emit about 3000. A mountain bike needs about 700 lumens minimum of light to ride safely on a dark trail at about 20 mph. A road rider can get away with about 400 because the surroundings are better lit and there is less hazard on the path. The other key factor is beam pattern or how the light throws and spread the available lumens. A laser, for example, is useless for riding it’s needle focused. A car headlight, on the other hand, spreads the beam nicely over a very wide area. In general, one needs a big, even beam pattern that allows one to see 25 yards down the trail while illuminating some of the side areas of the path. For trail riding, it’s best to have both but if one can only have one modest light, a helmet light is best. A helmet light will follow the riders eyes to help them see through corners and switchbacks. If one has a very powerful, wide beam light, then a handlebar light works very well. Ideally, the rider will have both lights complementing each other and lighting up the periphery with the bar light and seeing through corners with the helmet light. No one wants to be plunged into darkness half way though the evening commute – so of course battery life is an important consideration. The vast majority of bike lights are now USB rechargeable, usually with a rubber bung covering the port to ensure weatherproofing. All bike lights used to be wired, but the emergence of LED and lithium batteries have allowed bike lights to combine the light head and battery into one compact package. The big advantage is no wires and connectors to fiddle with. 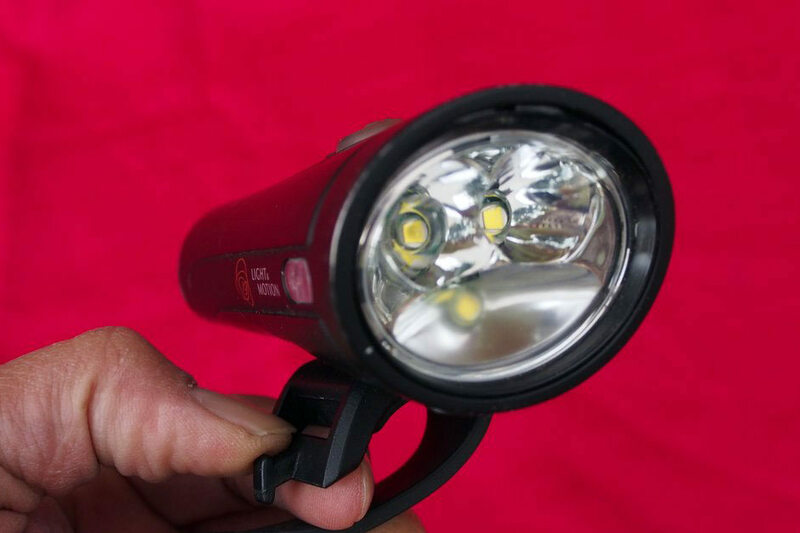 The self-contained bike light can also be used around the house or campsite as a very powerful flashlight. 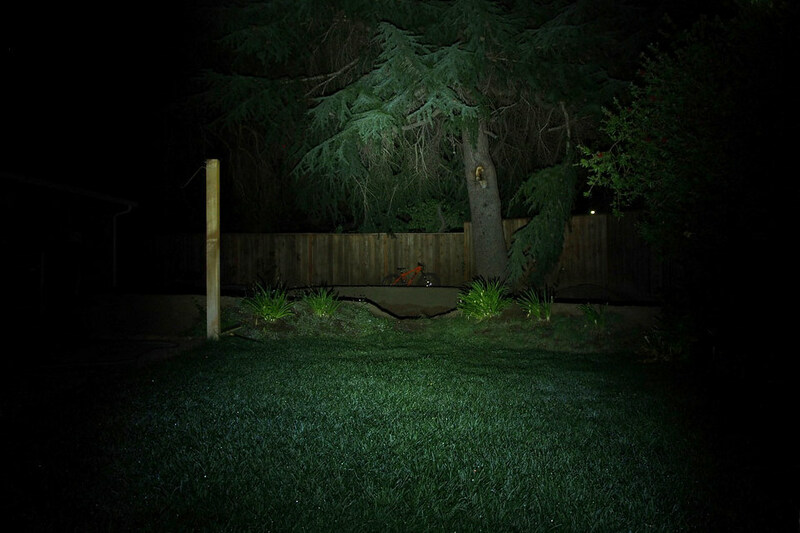 The disadvantage of self-contained lights is lower brightness and shorter run times. Since battery size is limited by the unit’s packaging, light output is typically limited to about 2+ hours at full power. But with modern technology, the lights are bright enough to be run at half power for 4-6 hours. Taz has an amazing lens for a big, consistent beam pattern. 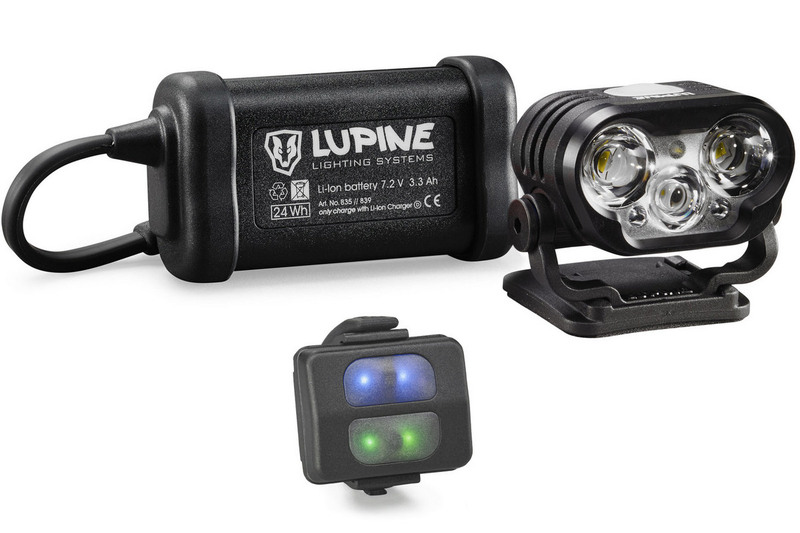 The Lupine Blika is the porsche of bike lights. Light, functional and built to perfection. Niterider Lumina 1100 features a very well built housing unit with good ventilation. Different bike lights have wildly different beam patterns and brightness levels. Regarding 5 dollar ebay light, google “Chinese bike lights burn down home”. You got to have some balls to trust a 5 dollar 8k lumen light……not worth saving 85 bucks. Absolutely agreed. The price, performance, safety, reputation, support of these US and International brands is very compelling now. 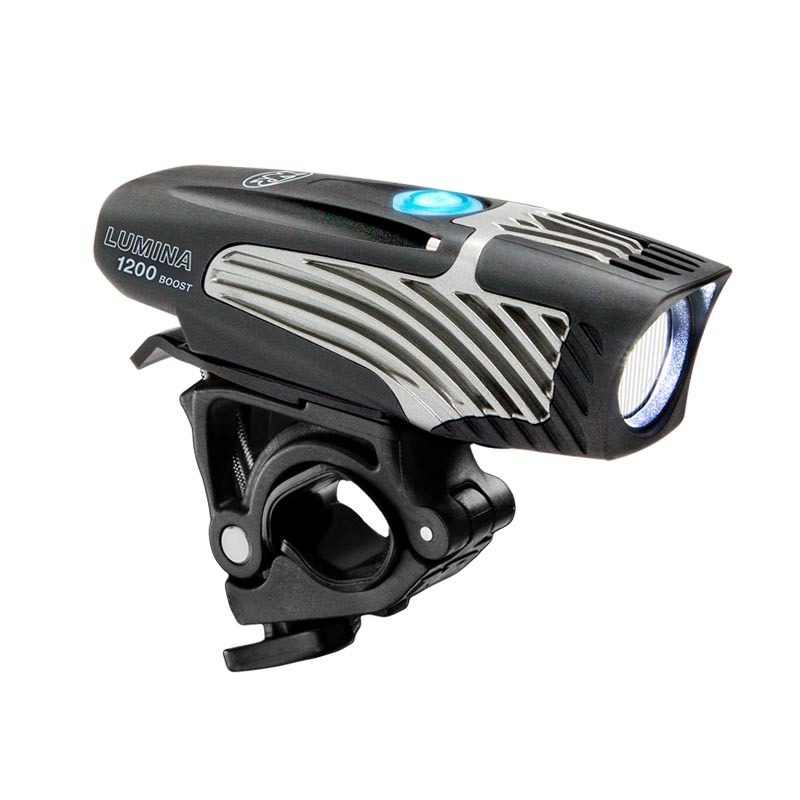 $100 for 1300 lumen light that will outlast your bike? That’s worth it. An old tail light on my dogs collar helps me keep track of him in the weeds as we are out at nights trail riding. My black Lab disappears and reappears from the shadows fast. Helps me to see him waiting at the next turn, off to the side, of the trail. I’ve bought 3 of those Lumina lights and they are great. Good recommendation Francis on the Lumina. I love the build, longevity, actual lumen count, light tone and durability of them, NightRiders are my go to. Usin NiteRider for more than few years. Excellent qusality and great customer service.